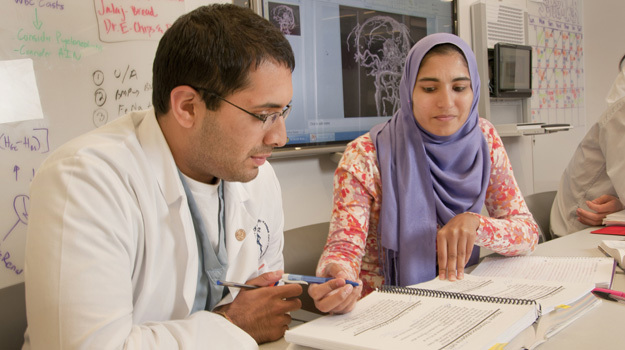 Once admitted to Medical Scholars, a student would then have a seat in the M.D. program for the appropriate term after graduating with a baccalaureate degree. M.D. students enter the School of Medicine in January each year, and enroll in the Human Structure Function series in January and remain in the program for 48 consecutive months. Three distinct curriculum plans have been devised, which allow M.D. students to proceed through the curriculum along one of three possible tracks. Two tracks provide the M.D. students with five months of time during which they do not formally enroll. The first track allows M.D. students to elect the five-month leave of absence immediately following completion of USMLE Step 1, and the second track provides for a five-month leave of absence midway through the clinical clerkship sequence. The third track allows M.D. students to complete their 48 months of continuous enrollment in December, and does not provide any break during the program other than one month of vacation time per year of enrollment.